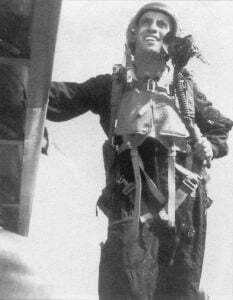 Born on 10 October 1923 in Muskogee, OK, James Jabara became America’s first jet ace on 20 May 1951 when he downed his fifth and sixth MiG-15s. Graduating from pilot training on 1 October 1943, he was no newcomer to combat. He had flown P-51s, first with the Ninth Air Force’s 363rd Fighter Group, where he was credited with 1 ½ aerial victories, and later with the 355th Fighter Group of the Eighth Air Force. Following the outbreak of the Korean War, Jabara was sent to Korea and assigned to the 334th Fighter-Interceptor Squadron, 4th Fighter-Interceptor Wing, flying the F-86 Saberjet. He claimed his first MiG-15 on 3 April 1951 and by the end of the month had added three more. Although he was scheduled to return to Japan on 7 May, he requested an extension and on 20 May downed two MiG-15s to become America’s first jet ace. Shortly after, Jabara returned to the U.S. for several months. Promoted to major, he requested a second tour of combat in Korea and in January 1953 returned to the 334th but initially scored no further victories. On 16 May, however, nearly two years to the day since he had become the first jet ace, he was credited with his seventh MiG-15. In the next 60 days he added eight more to his score, making him a triple jet ace and the second-ranking ace in Korea. Jabara returned to the States in mid-July 1953 to serve in various command and staff assignments in fighters. Promoted to colonel on 15 March 1961, he was commander of the 31st Tactical Fighter Wing when he was killed in an automobile accident in Delray Beach, FL on 17 November 1966.